Looking for a deliciously decadent dessert recipe that is easy enough to whip up? Try this Chocolate Hazelnut Meringue Cake, a moist chocolate-hazelnut cake topped with chocolate swirl meringue and drizzled with rich chocolate hazelnut sauce. Preheat oven to 160°C. Use melted butter to grease a 22cm springform pan. Line the base and side with non-stick baking paper. Melt the butter and chocolate over a double boiler. 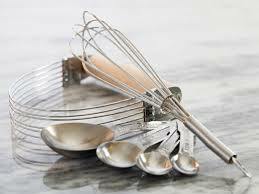 Use a metal spoon to stir occasionally until the mixture is smooth. Set aside for 5 minutes to cool slightly. Whisk the egg into the slightly cooled chocolate mixture. Add the sugar, flour, hazelnut meal and cocoa powder and stir until well combined. Pour the mixture into the prepared pan. Bake for 35 minutes or until a toothpick inserted into the centre comes out clean. Remove from oven and set aside. 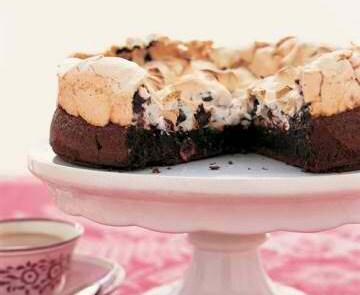 While waiting for the cake to bake, make the chocolate meringue. Using an electric mixer, beat the egg whites in a bowl until firm peaks form. Gradually add the caster sugar, 1 tablespoon at a time, beating constantly until the sugar dissolves and the mixture is thick and glossy. 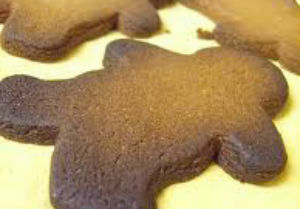 Increase oven temperature to 200°C. 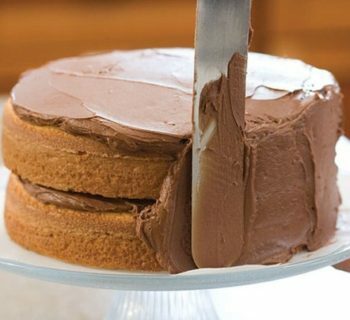 For optimum swirl effect, make the chocolate swirl meringue in two batches. Slightly fold half of the meringue mixture and half of the melted chocolate together to create a swirled effect. Spoon dollops of the mixture on top of the cake. 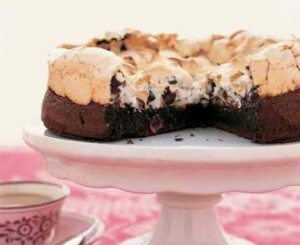 Do the same on the remaining meringue and melted chocolate. Bake the cake for another 8-10 minutes or until the meringue is firm. To make the chocolate-hazelnut drizzle, combine the cream and chocolate hazelnut spread in a small saucepan over low heat for 2-3 minutes or until smooth. Cool for 5 minutes to thicken slightly. Drizzle over the Chocolate Hazelnut Meringue Cake.